Time for another Read Aloud Thursday post. Read Aloud Thursday is hosted weekly over at Hope is the Word! 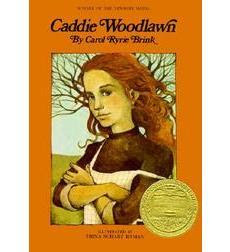 When I was creating my list of recommended chapter books, I made note of an old favorite of mine, Caddie Woodlawn . The more I thought back on how much I enjoyed it when I was young, the more I wanted to pull it out and try reading it aloud to the bookworms. It took us a few weeks to get through it (as we had family come into town mid-read) but finish it we did! If you are unfamiliar with the story of Caddie Woodlawn then you are in for a treat! Written by Carol Ryrie Brink, it is a retelling and a slight fictionalization of the life of her grandmother - Caddie Woodhouse. Caddie told her granddaughter, Carol, stories about her days as a young girl. 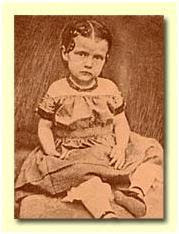 She told Carol of her brothers and sisters and life out western during the time of the Civil War. Carol Ryrie Brink figured that if she enjoyed hearing her grandmother's stories, others would also and so she committed to writing them down. I'd say her instincts were correct! These are stories that are a pleasure to listen to. Caddie is a tomboy who loves playing with her two brothers, Tom and Warren, best of all. Her mother is constantly fretting that Caddie will never learn how to be a proper lady while her father encourages her outdoor explorations. This book tells of the scrapes and adventures that Caddie has alongside her siblings. We hear about their interactions with the Indians, cold winters and amazing thunderstorms. We hear about their one room school house and letters from family back East. Woven throughout the story we get a flavor for how people in the West interacted with the affairs of the rest of the country during the Civil War which makes this book even more intriguing. There is plenty of adventures to be had and my oldest bookworm enjoyed the read quite well. I asked him his opinion and he said the enjoyed it all. His favorite chapter was the one in which Tom, Warren and Caddie ran into a rattlesnake. His favorite character - and mine also - was Caddie's sister, Hetty who couldn't keep a secret to herself and was a major tattletale - a fact which effectively kept her on the outskirts of her older siblings' play circle. Hetty just couldn't seem to keep her mouth shut for anything! She "must tell or burst" which I found particularly amusing. I guess I cannot say that this was an astounding read aloud or that it was particularly remarkable. Rather, it's a slow and quiet read, despite the adventures contained within. Bookworm1 certainly didn't hate it because he would ask me to read multiple chapters in one sitting. It isn't a silly or showy book, but it is a wholesome one. It's the time of book that makes you feel as if you have all the time in the world to stop and listen to a good yarn being spun. In short, it is very enjoyable. Of course, after we finished I had to look up more information about the actual Caddie Woodhouse. 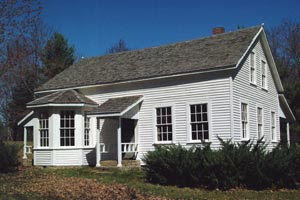 The house which the Woodhouse family actually lived in has been moved to a historical park and you can visit it if you like. Caddie eventually moved further west, landing in Moscow, Idaho. This is where her granddaughter, Carol, came to live with her after the death of both parents. I discovered that Moscow was their ultimate destination on a recent trip back to Idaho, where I had lived for almost a year. I was on the outskirts of town and had parked my car only to step out and discover the Carol Ryrie Brink Park across the street. You could have knocked me over with a feather! I can't believe I didn't realize this when I lived there. (It's not a large town, after all!) I'd love to go back and spend some more time seeking out information on Brink and her relations. 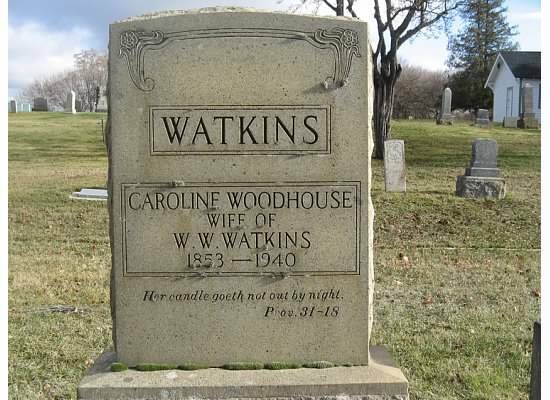 Below is a picture of the real Caddie Woodhouse as a girl, and also a picture of her tombstone. She is buried in Moscow, Idaho, along with her sister, Hetty. I can only highly recommend that you give the book Caddie Woodlawn a chance if you have not done so already! Even if you do not have a youngster to read to, it's just as good a read for adults as for children. Make some time! I think you'll enjoy yourself. I'm going to have to read this book. The only exposure I've had with Caddie Woodlawn is a movie version from when I was a child. I was not a big fan of the movie and that has soured my perception of the book (even though I know books are [almost] always better than movies). I had missed it as a child but discovered it as an adult. It wasn't my favorite of children's books, but it was interesting in places. My favorite part is when her dad talks to her about being feminine, that it's not just frills and girly things. CW is a childhood favorite of mine, also! And there's another literary destination to add to my list! ;). How funny that you lived in the same town as Caddie herself and Carol Ryrie Brink and didn't realize it. Do you remember gifting me with this? I loved it! And should share it with mine...someday soon. Absolutely one of my all time favorite books! I love this book, and so do my kids. The hay and egg scene is probably my favorite. Carol Ryrie Brink's books, Two Are Better than One and Louly (my second favorite of her books, after Caddie),are somewhat based on her life with her Grandmother. Chrystel is Carol and Grandma is Caddie.